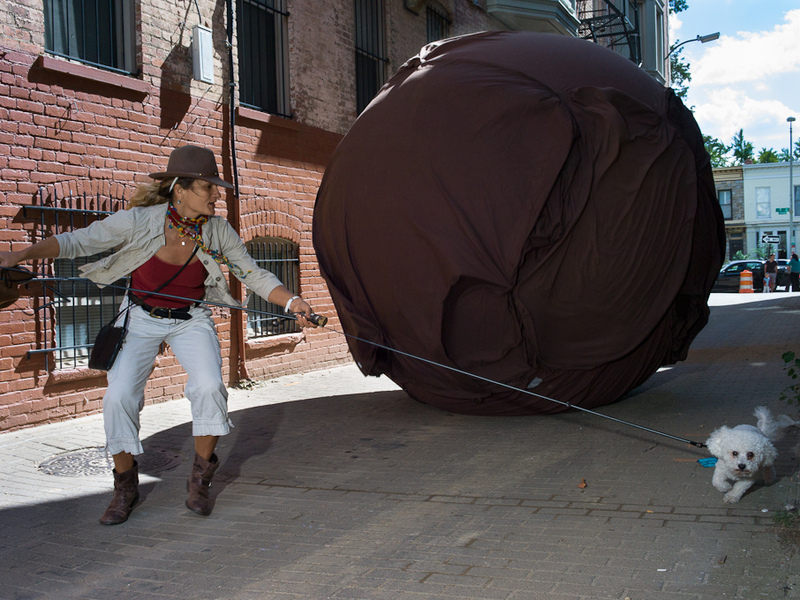 Re-Creating Indiana Jones' Boulder Run In D.C.'s 'Alley Of Doom' In an alley in Washington, D.C., strangers came together to simulate Indiana Jones' boulder run, using a very big inflatable boulder. Janet Whitley borrows a stranger's dog to run away from a 10-foot-high plastic boulder in Washington, D.C.'s "Alley of Doom." At a back alley in Washington, D.C., an innocent bike rider came upon a Prius driving right at him head-on. The Prius, in turn, was being chased by a 10-foot boulder. The bike rider had accidentally stumbled into "The Alley of Doom." For one day, anyone who showed up to this alley in the U Street neighborhood of Washington, D.C., could take a free turn at playing Indiana Jones — donning a fedora and whip and fleeing from a gigantic, rolling boulder. "The biggest hindrance to the idea was figuring out how to make the boulder," she said. "I went through everything from decoupage to weather balloons, but it was always a problem thinking about how someone would roll it. Then I remembered some random YouTube clip I saw about Zorbing." Zorbs are giant, inflatable plastic balls that people can climb into to roll down hills. McCann figured she could cover a Zorb with brown bedsheets and turn it into a makeshift boulder. To make it happen, she obtained a grant from the Awesome Foundation — a group that gives $1,000 grants to people with quirky ideas like this. The day of the event, folks trickled in from all around D.C. — a mix of parents and kids, 20-somethings and Indiana Jones superfans. Some heard about it online; others stumbled across the alley accidentally. Different runners put their own spin on the iconic scene. (You can see lots of pictures on Flickr.) One group donned Mexican lucha libre wrestling masks. One man used a unicycle and grabbed onto a rope to swing away before the boulder could hit him. One couple staged a dramatic scene in which the man bravely sacrificed his life to push his partner out of harm's way. Heidi Debeck filmed the boulder runs, and came away with a newfound respect for one of Indiana Jones' particular skills. "Watching these gives you so much more appreciation for the fact that Indiana Jones never leaves his hat behind, because it falls off all the time," she said. "Pretty much every time somebody's run, I think it's fallen off — unless the person has held it to their head." For Joel Finkelstein, who showed up with his kids, ages 7 and 4, this game was the fulfillment of a lifelong dream. "I loved Raiders of the Lost Ark my whole life. It came out when I was 6, and I saw it every weekend that summer when it was in the theater, 16 times," he said. "Every time I went to a playground for 10 years as a kid, I would run from an imaginary boulder, absolutely. It's pretty cool to have a real one." McCann, who organized the event, doesn't describe herself as an Indiana Jones superfan. She said for her, it's more about creating a space where neighbors and strangers can come together and play. "There's a couple of grandmas out here, just hanging out, smiling," she said. "People can tap into that feeling." McCann said she's especially interested in finding different ways for grown-ups to cut loose. "As adults, we think we play because we go to bars, but that's different. And I'm not hating on the bar experience, but there's a big difference between going to a bar and having a beer and running around in an alley dressed as Indiana Jones."